Reference number for this case: 21-Oct-54-Kerhuon. Thank you for including this reference number in any correspondence with me regarding this case. The two phenomena occurred last Thursday and at several hours of interval, but in the light of the explanations which were given to us by the involved people, it does not seem that there is a precise and close connection between them. "It was 8 hours of the morning, we were told, and the sun was already shining. I contemplated some small clouds which ran in the sky. They were not of such a particular interest, except for the one of them which caused an amused reflexion of my share. - Don't you think this cloud shows the shape of a flying saucer? I asked a friend who was at my side. - To be sure I decided to go to seek my binoculars but when I came back the craft had disappeared..."
Our interlocutor however discussed the phenomenon with some other people and it is at the time when everyone was going to think about other things that somebody in the group found the trace of the saucer. One could follow it one moment, then it disappeared, again, definitively this time. "The object, concluded the main witness, had the shape of a biconvex lens, with two cuppolas, one above, the other below the lens. The whole shone very strongly, not with the manner of a metal but rather of the crystal..."
NE/PLOUGASTEL,FR:NAVAL ENGNR+1:VLUMn.LENS DISK HVRS/8km alt:CLOUDS INTERVENE.. Probably reflexion of the sun on a saucer-shaped ice high altitude crystal cloud. 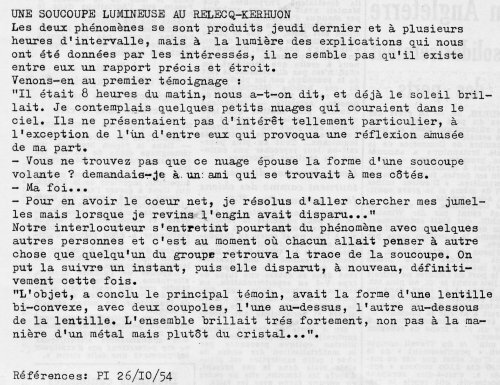 [pi1] Transcription of an undetermined newspaper article for October 26, 1954, communicated by a reader of my sebsite, 2009. 1.1 Patrick Gross December 30, 2018 Addition [lh1].